Real fasting (upwaas/vrat/upaas) is not my cup of tea... it is one of many religious practices followed by lots of people. Thankfully in my religion there's always a loophole for every rule.. for example, if you don't have specific things for a religious ritual you can substitute Akshata - Rice grains with kumkum powder for nearly anything, If you cannot make it to the temple every week, just think of your favorite deity (there's lots of choice with billions of gods) and that's enough. Really - it is the thought and faith that counts! Coming back to fasts - there is a small set of (farali/fariyali) things you are allowed to eat on a day of fast. There is a special meal - farali/fariyali meal that is amazingly delicious and believe it or not- quite heavy! I used to love the days when my mom made this special meal... the best part was - if you did not fast you could eat both - the regular food AND farali food! So I would wake up and have my usual cup of milky coffee and Parle G etc non-farali stuff and then at lunch time I would hog on the special farali meal!!! I will be posting all these recipes.. for today - let's start with Sabudana Khichadi! 2. Stop adding water to sabudana as soon as the water level is barely above the sabudana. 4-6 hours later, the sabudana should be well soaked and you should be able to see each sabudana kernel separately. Add peanut powder, red chili powder, salt to taste and 1/2 tsp sugar. Taste the mixture and adjust spice level if necessary. For the tadka - heat ghee in a pan, add cumin seeds and slit green chilies. When the cumin seeds turn brown add the potato pieces and saute until the potatoes are golden brown. Then add the sabudana mixture and mix well with the tadka. 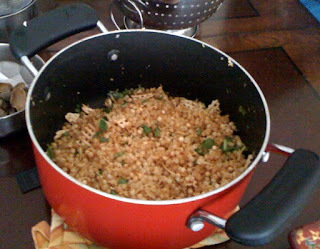 Turn the heat to low-medium and keep the khichadi covered for about a minute. Remove the lid and mix well. Repeat this step of covering for a minute followed by stirring till you get a semi soft consistency for sabudana. Turn the heat off and add lemon juice and mix well. Garnish with coriander leaves and fresh grated coconut. 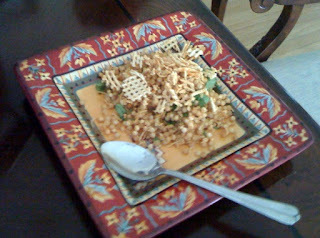 Sometimes I garnish the khichadi with potato chips or deep fried potato papad like in this picture.. I recently made this for the first time but did not think of adding fried chips on top ;) Next time I will upgrade my version for a better experience! yep - I got this idea from my Indore visit.. the fariyali khichadi in Indore - they serve it with fried chips.. That khichadi is quite nice and different - it is steamed - so no ghee ka tadka, also has a little bit of dry coconut and loads of lemon juice.. hmmm makes me wanna go back. I have tried making it at home.. it had similar taste.. but I need to improve on the recipe before I blog it.